PSG demand £40million for Marco Verratti Arsenal and Manchester United are targeting Paris Saint Germain midfielder Marco Verratti, as per several reports. 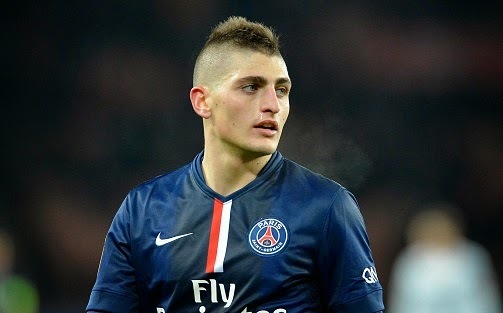 Arsenal and Manchester United are targeting Paris Saint Germain midfielder Marco Verratti, as per several reports. Metro reported few days ago that Arsenal boss Arsene Wenger is keen to land a midfielder in the summer and he has shortlisted PSG star man Marco Verratti. However, the recent reports claim that the French giants will not allow him to leave for £40million. The 22-year-old has recently penned a new long term deal which will keep him until 2020. Manchester United boss Louis van Gaal could take a step back after PSG’s demands for the Italian but Arsene Wenger will hopefully look to negotiate the deal. Arsenal signed young midfielder Krystian Bielik in the winter window, and several midfielders are likely to leave the club at the end of the season including Mathieu Flamini. Verratti is a regular player for the Ligue One side, he has made 21 league appearances and four Champions League appearances so far this season. The PSG star is a holding midfielder who connects the game from the deep with his accurate passes. He is not a goal scoring midfielder, he has netted only one goal in 17 starts in Ligue One.